OMG! Batman and Vixen are joining the FF! By the look of Turner’s art, it looks like maybe Badrock and a flaming Flash? Or is that Superman? I thought Hudlin was taking over FF. Is that coming up, or was I having a nightmare? Hudlin is writing the FF in Black Panther. well, there goes that surprise. Jerk face. 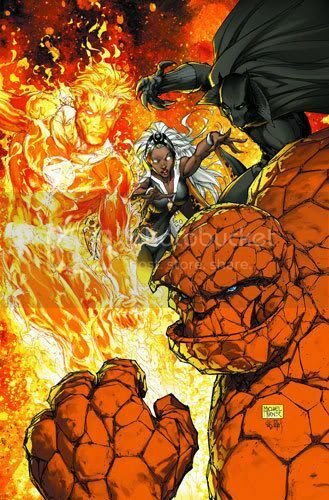 It’s got to be awfully hot for Storm and Black Panther (can the Thing even get hot?) with Johnny going all flamey so close to them.